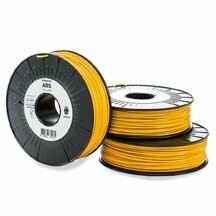 The ABS Ultimaker is a filament that has been specially developed by Ultimaker for use on its own machines. The ABS Ultimaker is optimised for printing, the printer settings are carried out automatically after selecting "ABS Ultimaker" on the printer screen. This ABS is resistant and will be suitable for functional prototypes and mechanical pieces. Find ABS filament from the Ultimaker brand on Makeshop3d.com Developed by Ultimaker to ensure greater usability of the ABS but also improved quality for your pieces, while remaining simple to print was the challenge that Ultimaker set itself with this new Ultimaker consumable in ABS which, thanks to its unique composition, as well as the profiles specially designed by Ultimaker, makes its materials easier to print. Ultimaker has developed its own ABS which is simpler to use than other ABS consumables on the market. With profiles pre-saved on CURA, it becomes easy to print even complex pieces in ABS. The ABS Ultimaker filament is particularly suitable for the design and creation of functional prototypes.